Kidrobot is proud to present the MUNNYWORLD MEGACONTEST. As a follow up to last year’s MUNNY MUNTH, we have taken the world’s greatest custom contest to a whole new level. This year is bigger and better than ever. You can enter any of the 7 mini MUNNYWORLD characters as many times as you want, in our various assorted contest categories and the winners will be determined by a talented pool of artists and celebrity judges. The grand prize winner will snag a spot in the Dunnys Series 2012. Hit up the DIY page to download your templates for practicing before you start customizing, get tips from the pros or watch cool videos. Get the low down on our Stores & Events page for all the Sketch Sessions popping up around the globe and find your nearest MUNNYWORLD retailer on our handy dandy Google map. In celebration of the new MUNNYWORLD MEGACONTEST, Kidrobot has launched our new official MUNNYWORLD Facebook Fan Page. 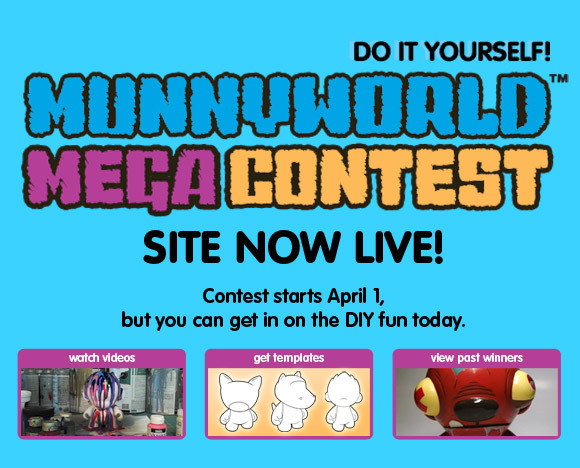 The contest doesn’t start until April 1 but you can get in on the DIY action now! The post MUNNYWORLD MEGACONTEST Website Is Live appeared first on Kidrobot Blog.